Based on the comic series by Stan Lee and Jack Kirby, The Avengers: Age of Ultron is the story of a group of superheroes who fight to save the world as they meet their greatest challenge in an artificial intelligent android who is bent on global destruction in his view of bringing peace. Written for the screen and directed by Joss Whedon, the film plays into the team known as the Avengers as they deal with fear but also in being forced to face an enemy who knows how to tear them apart. Starring Robert Downey Jr., Chris Evans, Chris Hemsworth, Scarlett Johansson, Jeremy Renner, Mark Ruffalo, Elizabeth Olsen, Aaron Taylor-Johnson, Linda Cardellini, Cobie Smulders, Stellan Skarsgard, Don Cheadle, Samuel L. Jackson, Paul Bettany, and James Spader as the voice of Ultron. The Avengers: Age of Ultron is a thrilling and exhilarating film from Joss Whedon. The film revolves around the superhero team known as the Avengers who are tasked with stopping evil forces including Hydra from unleashing terror into the world where a peacekeeping initiative in the form of an artificial intelligent being known as Ultron has threatened to destroy the team and bring global destruction in an act of bringing peace to the world. While it is a plot that is simple in terms of good guy vs. bad guys, it is much more complex considering that Ultron was created by Tony Stark/Iron Man (Robert Downey Jr.) with the aid of Dr. Bruce Banner/the Hulk (Mark Ruffalo) as a program to help save the world after seeing a dark vision which was brought to him a young woman in Wanda Maximoff/Scarlet Witch (Elizabeth Olsen) during a raid on Hydra by the Avengers. Wanda and her twin brother Pietro/Quicksilver (Aaron Taylor-Johnson) would both aid Ultron in destroying the Avengers where the team would become very vulnerable with Stark trying to make sense of what he created. Joss Whedon’s screenplay does have a more traditional structure as it sort of plays into a rise-and-fall scenario of sorts for the Avengers. The first act pertains to the Avengers having their first encounter with the Maximoff twins and Stark’s intentions in creating Ultron. The second act plays into Ultron’s plans with the Maximoff twins aiding him where Pietro’s speed is his power while Wanda is telekinetic and can manipulate people’s minds as she would be able to make the Avengers, with the exception of Clint Barton/Hawkeye (Jeremy Renner), vulnerable. Yet, the Maximoff twins aren’t exactly antagonists as they are essentially people who have a legitimate grudge towards Stark but they also display some humanity which makes them more intriguing. By the time the film’s third act emerges as it relates to a mysterious gem inside Loki’s scepter and a project Stark was involved in which could be the one thing that could save the Avengers and the world. Whedon’s direction is definitely sprawling in terms of the world that is created as well as the fact that there is a lot at stake in what the Avengers are doing. Shot in various locations such as South Africa, South Korea, Bangladesh, New York, Italy, and some studio-based shots in London, the film does have a more global feel where it is about the Avengers trying to protect the world from evil as it would begin in Eastern Europe when the team takes down one of the last Hydra plants in the continent. While there are some great usage of wide and medium shots in the film to establish certain locations as well as play into what is happening when the team isn’t fighting the bad guys or each other. Whedon also finds way to create an intimacy as well as bring humor into the fray as it relates to Steve Rogers/Captain America (Chris Evans) who has issues with the team saying profanity or the growing attraction between Banner and Natasha Romanoff/Black Widow (Scarlett Johansson) as the latter is the one person who can calm the Hulk down. The direction also has this air of nihilism as well as the many complexities and flaws about humanity as it relates to Ultron’s view of things. He sees humanity as Neanderthals who are unwilling to evolve as well as create chaos in an attempt to restore order and such. In some ways, he is right but he would take his views to the extremes which wouldn’t just prompt the Avengers to finally pull themselves back up and fight the fight. Even as they do whatever they can to even save the innocent and prove that humanity can be worth saving no matter how bad things are. Overall, Whedon creates a very exciting and compelling film about a group of superheroes and fighters who try to save the world from an android hell bent on destroying the world. 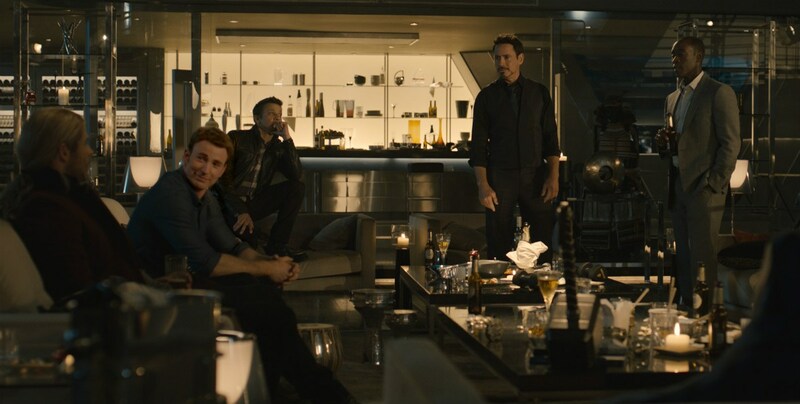 Cinematographer Ben Davis does excellent work with the film‘s cinematography in creating some unique moods and lighting schemes for many of the film‘s interiors such as the Avengers‘ main base as well as some scenes set at the Maximoff twins‘ home country in its exterior settings. Editors Jeffrey Ford and Lisa Lassek do nice work with the editing in creating some unique montages for some of the dreams and flashbacks for some of the characters under Wanda‘s mind manipulation as well as some rhythmic cuts to play into the action and drama. 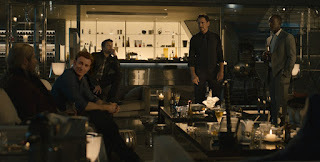 Production designer Charles Wood, with supervising art director Ray Chan and set decorators Chris “Flimsy” Howes, Sheona Mitchley, and Richard Roberts, does amazing work with the design of the Avengers home base as well as the quaint safe house that belongs to Barton where the team would regroup as well as the lab where Ultron sees the next step into his evolution. Costume designer Alexandra Byrne does terrific work with the costumes as much of it is casual for the gang when they’re not working. Hair/makeup designer Jeremy Woodhead does fine work with the look of the characters from the hairstyle of the Maximoff twins to the look of the mysterious being known as Vision. Visual effects supervisors Geoffrey Baumann, Huseyin Caner, Michael Mulholland, Katherine Rodtsbrooks, Ben Snow, Alan Torres, and Christopher Townsend do brilliant work with the visual effects in the design of Ultron in his evolving state from being one android and then another to the look of the Hulk as he rampages everything around him. Sound designer David Acord, with sound editors Christopher Boyes and Frank. E. Eulner, does superb work with the sound in the way some of the gunfire is heard along with sound effects that play into the action and suspenseful moments in the film. The film’s music by Brian Tyler and Danny Elfman is brilliant as it is this great mix of bombastic orchestral music with some electronic textures as it play into much of the action and drama that occurs in the film while music supervisor Dave Jordan provide a soundtrack that mixes old-school band music, classical pieces, and operatic pieces as it‘s a piece that Banner uses to soothe the Hulk. The casting by Sarah Finn and Reg Poerscout-Edgerton is incredible as it features appearances from Anthony Mackie as Sam Wilson/Falcon, Don Cheadle as Col. James “Rhodey” Rhodes/War Machine, Thomas Krestchmann as a Hydra leader in Baron Wolfgang von Strucker, Henry Goodman as Dr. List who was doing experiments on the Maximoff twins, Kerry Condon as the voice of Stark’s new AI protocol named F.R.I.D.A.Y., Julie Delpy as Romanoff’s Red Room headmistress Madame B. in a flashback, Hayley Atwell as Peggy Carter in Captain America’s dream sequence, Idris Elba as Thor’s friend Heimdall in a dream sequence, Andy Serkis as an arms dealer in Ulysses Klaue who provides Ultron some formulas he needed, and Claudia Kim as the geneticist Dr. Helen Cho who is a friend of Stark as she is also key to the thing that Ultron craves for and would be the catalyst to save the world. Linda Cardellini is fantastic as Barton’s wife Laura as a woman who would provide the Avengers a safe house as well as be the person who can ground Barton and give him a reason to stay alive. Cobie Smulders is excellent as Maria Hill as a former S.H.I.E.L.D. agent who works for the Avengers in planning everything that is happening while being the one person she can bring Nick Fury in to help them. Samuel L. Jackson is brilliant as Nick Fury as the former leader of S.H.I.E.L.D. who tries to rally the Avengers to get their wind back after their huge defeat while revealing exactly more of what Ultron is trying to do. Aaron Taylor-Johnson is terrific as Pietro Maximoff as a man who can run very fast at impossible speed while Elizabeth Olsen is amazing as his twin sister Wanda as this young woman who is very dangerous with her telekinetic powers that can destroy anything in her path and having the power of mind control. Paul Bettanny is superb in a dual role as Stark’s old AI companion J.A.R.V.I.S. and later the mysterious being known as Vision who is the key catalyst that could help the Avengers in the war against Ultron. James Spader is phenomenal as the voice of Ultron as an AI creation who sees Stark’s ideas for peace as something worse where he is filled with some dark humor as well as being someone that is dangerous in what he could unleash on the world. Chris Hemsworth and Chris Evans are marvelous in their respective roles as Thor and Steve Rogers/Captain America as two heroes who are both powerful but become vulnerable as the former copes with visions he had relating to his home planet as the latter deals with the idea of what could’ve been if he hadn’t been frozen for 75 years. Robert Downey Jr. is astounding as Tony Stark/Iron Man as the billionaire/scientist who tries to do good in creating Ultron only to realize what went wrong as he tries to shield the blame on himself though is aware that he is at fault. Mark Ruffalo is tremendous as Dr. Bruce Banner/the Hulk who finds a balance in being himself and the Hulk until his encounter with Wanda has him succumb to fear and uncertainty. Jeremy Renner is great as Clint Barton/Hawkeye as the great sharpshooter who is the glue of the team as he would be the one to carry them as everyone becomes vulnerable while revealing another life he has that few know about. Finally, there’s Scarlett Johansson in a radiant performance as Natasha Romanoff/Black Widow as the skilled assassin who is also expressing feelings for Banner while becoming vulnerable by her own flashbacks where she copes with the fact that she too is a monster in some ways. The Avengers: Age of Ultron is a sensational film from Joss Whedon. Featuring a great cast, an intriguing premise, compelling themes, and lots of exhilarating action and suspense. The film is definitely a blockbuster film that manages to be a lot of things but also provide some substance to have audiences talk about the ideas of war and peace. In the end, The Avengers: Age of Ultron is a spectacular film from Joss Whedon. I'm glad you liked this too. I had a few issues, mostly with how they portrayed Widow and what ultimately happened to Quicksilver, but I really do love this film. I've watched it several times since it came out on DVD. Great review! It is flawed but I still enjoyed it. It's just a fun blockbuster film with some substance. What more can you ask? To be honest, I barely remember much of Age of Ultron, but I remember REALLY disliking the *romance* between Banner and Natasha. Perhaps it was the superhero fatigue that made me enjoy this less than I had hoped. Still, I'm super excited for Captain America: Civil War!! @ruth-I didn't think it was that bad because I think it humanized Banner more as well as provide someone that could calm him down when he's the Hulk while also providing a balance since Natasha would admit to herself that she is a monster. I too am stoked for Captain America: Civil War. I'm glad you liked it but I literally fell asleep during it (yes, in the theatre) which I NEVER do (although: booze + recliners in the VIP theatre = slightly more likely). I'm really over these guys. @assholeswatchingmovies.com-I do like seeing these heroes but I would like a break every 2 three years so I wouldn't be overwhelmed and have the actors do something else. I liked this movie a lot, esp. the opening action sequence, which had the cinematic equivalent of a Jack Kirby splash page (there's a similar moment in the final showdown towards the end of the movie) and I loved the ambition and sheer scale. I think that, at times, the movie threatens to be crushed by its own ambition but Joss keeps it going through sheer force of will. I think I still prefer the first AVENGERS movie as it a more rousing adventure whereas ULTRON is a much more somber affair. @J.D. Lafrance-I too prefer the original film but this was still fun to watch to watch as I just enjoyed those characters and see what they do when they're not saving the world.